The Ford Super Duty F-250, redesigned in 2017, is a heavy-duty pickup that shares the basic styling of its little brother the F-150 in some of its aluminum body panels. The F-250 is bigger and more boxy, and has more steel in its fully-boxed frame, which was made dramatically more rigid in the redesign. It can tow or carry an astonishing amount of weight. It can also carry up to six people swathed in leather and showered with rich wood. Ford calls it the Super Duty, but remember there’s also an F-350 and F-450 (they’re not called Hyper Duty and Uber Duty). Besides those heavier-duty Ford trucks, rivals for the F-250 include the Chevy Silverado 2500, GMC Sierra 2500, Ram 2500, and the Nissan Titan XD. For 2019, about the only change is that the CD player has been removed from all models, as the world moves on to other formats. 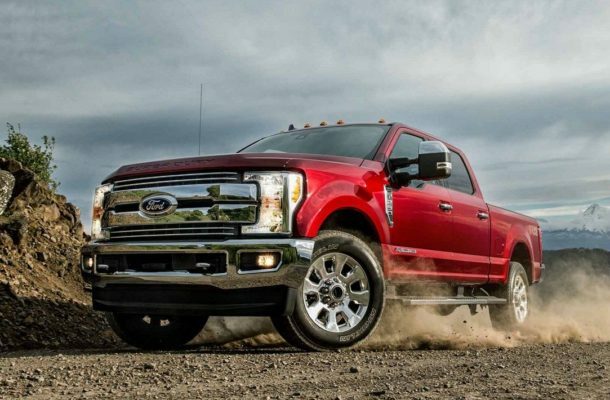 The Super Duty’s two engines differ a lot from the F-150’s six engines. The base engine is a big 6.2-liter V-8 making 385 horsepower and 430 pound-feet, while the upgrade engine is a 6.7-liter turbodiesel V-8 making 440 hp and 925 lb-ft of torque. The F-250 is rear-wheel drive, with four-wheel drive available. Both engines use a 6-speed automatic transmission, but the turbodiesel’s transmission is beefier. This vehicle can travel 1,000 miles on a tank of fuel, and tow 32,000 pounds. Small catch there: you have to have a commercial license. The EPA doesn’t do fuel-mileage testing on trucks this big, nor are manufacturers required to submit their own numbers. But if you crunch what Ford claims about 1,000 miles on a tank of diesel fuel, using the optional long-range tank, you get 20 highway miles per gallon. We know, big leap of faith, to buy that. Neither the NHTSA nor the IIHS has crash-tested the Super Duty extensively. However the NHTSA does give it a five-star side-impact rating for the crew-cab model, as well as a worrisome three stars in rollover resistance. Super Duty pickups get some of the active-safety features found on passenger cars, such as blind-spot monitors and adaptive cruise control–as optional equipment. Automatic emergency braking is not available, but should be. The Super Duty comes in stripped-down XL trim, plus XLT, Lariat, King Ranch, and Platinum. Ford sells it with two different bed lengths, two powertrains, three cab styles, two wheelbases, and at least seven rear axle ratios. The three cabs are Regular Cab, with two doors and a small folding rear bench; SuperCab, with narrow rear-hinged rear doors; and Crew Cab, with four full doors and a rear seat. The XL is very base, with vinyl seats and floor mats, manual windows and manual door locks, and no Bluetooth. It does have air conditioning, however. With the Regular Cab, longer 8-foot bed and two-wheel drive, it can be had for $33,150, as cheap as an F-250 gets. It might be less, if it were available with the 6-foot-9-inch bed, but it’s not–the only model that can’t be had with the shorter bed. With the Crew Cab, 8-foot bed and 4wd, the XL is $39,750. So that’s $6,500 to get 4WD and a full-size rear seat, with seating for five or six. That price difference is more with some models, less with others. The XLT adds cloth seats, power windows and locks, and a basic infotainment system with a digital display. With the Regular Cab, 8-foot bed and 2WD, it’s $37,365. Luxury begins to come into play with the Lariat. It has an 8.0-inch touchscreen infotainment system, 18-inch alloy wheels, leather upholstery, and power-adjustable pedals. Its price ranges from $46,140 to $51,860. King Ranch trucks add their own western-themed trim and their own grade of leather, premium audio, heated and cooled front seats, and dual-zone automatic climate control. It goes from a $55,610 to $58,805. The Platinum gets 20-inch wheels, B&O Play audio, power running boards, and satin-metallic trim. It tops out at $63,535. With options, it can hit $80,000. There’s something throwback about the styling that we can’t put our finger on. The Super Duty appears to be moving boldly into the future while honoring its heritage. It’s got a strong resemblance to the smaller F-150, especially in headlights that mimic a C-shaped theme. But the F-250 is bigger and its creases sharper, and its distinctive square fender flares are unique. The massive grille weights the truck down from some angles. It has black bars on lower models, chrome on mid models, perforated chrome on Platinum. The door handles are chrome and horizontal, which along with black B-pillars make the big truck look a bit less heavy duty. The Platinum has a band of bright metal across the tailgate and wears its name stamped into the hood. The F-250 cabin isn’t as understated as that in some GM trucks, nor cowboyish like some Ram models. Its cabin chooses substance over style, while striking a balance of comfort and flair. It can be luxurious with wood and leather in the top trims, but it’s still about utility, with scratch-resistant plastic and rugged cloth in lower trims. Even on the Platinum model, you can opt for vinyl trim, in case you want all the convenient technology and active safety, but not the bother of cleaning carpets. Makes sense for trucks that see a lot of mud, snow or wet. The cloth upholstery on the XLT is comfortable and high quality. The leather on Lariat is color coordinated, and on King Ranch it feels like an expensive saddle. Power seats come on the top models, with an available massage feature. There’s even a massage feature available. If that sounds precious for a work truck, try towing for eight or 10 hours at a time. The Super Duty has just about the best and most versatile cargo bed in the business, measuring either 6-feet-9 or 8 feet. It’s the F-150 that has the short 5-foot-6 bed, for that lighter-duty need. The four-door Crew Cab has enough room in the rear seat for 6-footers, even three of them. The seat folds to create a large amount of cargo space. The Regular Cab and SuperCab get small rear benches that also fold. The center console in all F-250s is wide and deep. With the front bench seat, it flips down from the center seatback; and with the front bucket seats, the large console offers excellent storage space for all the driver’s stuff, while also being a solid spot for a laptop. It can be a mobile office, making it a favorite with contractors. Convenience features include a camera aimed at the truck bed, useful for hooking up a gooseneck. An optional tow camera setup uses four cameras for a 360-degree view around the truck. Backing up is eased somewhat with trailer reverse guidance visual cues on the rearview camera. Also available: a trailer camera, useful when backing up. Cameras every which way, seven all told. With the 6.2-liter V-8 making 385 horsepower and 430 pound-feet, mated to the 6-speed automatic transmission, the F-250 can carry 7,680 pounds of cargo in the bed. The 6.7-liter turbodiesel, making 440 horsepower and 925 foot-pounds of torque with its stronger 6-speed, is smooth and quiet at cruising speeds. The F-250 isn’t too arduous to drive on the street, although it does have totally truck-like handling traits. If you don’t need that towing or cargo-carrying capacity, the F-150 may make more sense. You can get an 8-foot bed on the F-150, if that’s what you need. Ford says the chassis was made 24 times more rigid when it was redesigned in 2017, which makes for smooth and quiet ride, especially with the suspension being tuned to take advantage of the stiff chassis. As for the handling, the adaptive variable-ratio steering makes truck significantly more maneuverable at low speeds and less jittery at high speeds, by quickening the steering at low speeds and slowing it at high speeds. It enables parking in tighter spaces, and makes highway driving more relaxing. F-250 short-bed models (with shorter wheelbase) do an excellent job of pulling bumper-pull trailers and can also handle weighty goosenecks. They are quite stable, much more so than an F-150 or any other light-duty pickup. Adaptive cruise control is available for use even when pulling heavy trailers. All the latest safety features are available, including tire pressure monitoring for the trailer, blind-spot monitors that will work for trailers up to 33 feet long, lane-departure warnings, and forward-collision warnings. The Ford F-250 is an ultimate tow rig that can pull up to 32,000 pounds—and do it all with massaging seats and touchscreen infotainment. You can choose 2019 Ford Super-Duty as your ideal vehicle. There are several options of type, series, special specifications and colors of 2019 Ford Super-Duty. Compare and Find the right 2019 Ford Super-Duty for You! See 2019 Ford Super-Duty Outlet Stock that available at your place and GET The EXCLUSIVE DEALS!